Today is the last day of National Runaway Prevention Month. Throughout the month, organizations and individuals across the nation came together to be a source of light, hope and support for runaway, homeless and at-risk youth. A huge thank you to all who hosted and participated in the many national events throughout the month. Your support built critical awareness on an issue that too often feels invisible. Below are some highlights from events held by NRPM partners but you can certainly find more by going on Facebook, Twitter and Instagram and searching the hashtag #NRPM2018. We kicked off National Runaway Prevention Month at this year’s RHY Grantees Training hosted by the Runaway and Homeless Youth Training and Technical Assistance Center. This was a perfect way to kick off NRPM alongside our partners and fellow RHY providers across the nation all in one place – Austin, Texas. – Skate Park After Dark – Albany, OR AND Corvallis, OR. by Jackson Street Youth Services. For Teachable Tuesday, NRS provide current runaway and homeless youth statistics available for individuals and organizations to share on social media to raise awareness about RHY issues. We highlighted information from Chapin Hall’s Missed Opportunities report, True Colors Fund’s State Index report and more toolkits and materials. 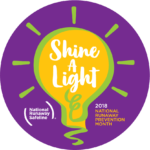 While NRPM is nearing a close, we encourage everyone to continue these critical conversations to “shine a light” on these issues all year round! If you’re not already a NRPM partner, please reach out to Rachel Reynolds, Outreach & Prevention Specialist, at rreynolds@1800RUNAWAY.org to learn more.